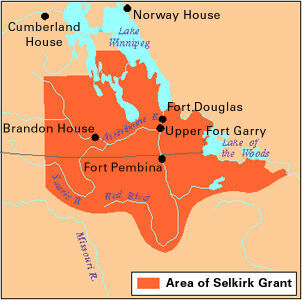 Captain Rodolphe de May, Swiss officer once at the British service under the Colonel Frédéric de Watteville, entered into an agreement with the Earl of Selkirk, owner of the Hudson's Bay Company and considerable land around Red River, to attract Swiss settlers in Red River. Unfortunately, most of the promises made to the prospective settlers were not held and, by the end of 1826, not a single Swiss family remained in the red River country, most of them moving South in direction of the Mississippi. To convey and to supply each colonist with food during the journey tot he red River Colony, free of charge, and to render the voyage as agreeable as possible. Upon his arrival at red River to find him lodging in one of the established homes until he builds a house of his own, for the construction of which he will be supplied with the necessary means and assistance without of delay. To advance him wheat, potatoes and other seed as required for the first year to sow land granted to him, but he will be obliged to repay in kind from the first crop. To supply him with all the requirements for his own home in the way of furnishings, farm implements and other materials at as reasonable a price a possible, the cost of which plus the current interest at five percent must be paid within the course of three or four years. Thereafter, the farm-fee payable will be equal to half a bushel per arpent, which is very moderate in view of the extraordinary fertility of the land and will not constitute a great burden upon the settlers. In the event of him wishing to commute, the settler may do so provided he pays in one lump 500, i.e. five hundred bushels of wheat. In this way he may be quit of the said fee for all time. This fee is the only charge he will have to pay. He is also free to choose his land wherever he may wish and in whatever locality pleases him the most. Before his departure to pay in cash the sum of 10 gold louis, and upon his arrival in the Colony to pay in the course of 4 or 5 years, the sum of 11 gold louis with interest at 5 percent starting from the day of his of departure in Rotterdam, the payment to be made at regular intervals. To pay as soon as possible the price of the furnishings and other effects supplied to him, with the amount of the interest due. That he and his family will, during the voyage to the colony, conduct themselves and behave as quiet, reliable, honest folk, and give all assistance and respect to those who are authorized to transport and to look after them. Finally, always to behave as quiet, thoughtful, peaceful and honest citizen. That he will not under any consideration, give aid or assistance, either in food or merchandise, or in any other manner whatsoever, to whoever may have the temerity to encroach upon this exclusive privilege of the said Company in its Territory, by trading in furs contrary to the said privilege. That he will help to build and maintain the roads and public highways at suitable times during the year, with his own labour and that of his sons and servants, and by lending his work animals for hauling and other necessary tasks, on the day and at the place specified by the inspector, this service to be limited to six days a year. That he will provide for the upkeep of the minister and the schoolmaster of his own faith, that is to say he promises with the help of his sons to do all the farm work required of him, providing for that purpose his servants, his work animals, wagons and tools on each day and at the place indicated by the schoolmaster, but not to exceed six days a year, that is to say two days in spring, two days in summer two days in autumn. These working days are to be divided equally between the minister and the schoolmaster. in this way the land from which each work derive his subsistence will be tended. That he and his family will promptly contribute towards the of fence of the country against enemies both within and without and that they will endeavor to promote the peace, safety and prosperity of their new country; as far as shall be within their power they will obey of their own free will the laws and regulations which are now in force in the Colony and in the other English provinces of North America. Finally, he undertakes at a future date to receive into his new home settlers as they arrive, until such time as they shall build their own dwellings, to help and assist them (on the understanding that this assistance be limited to providing house and lodging but not to include of board or other similar items) it being only fair that he should render unto others what he himself has received. He also promises to give every assistance in his power upon all occasions during the course of the journey by boat and from Hudson's Bay tot he Colony. Document dated 31 July 1822, probably the work of Walter of Huser, one of the Swiss settlers. This document is to be found in the Bulger Papers, volume II, pages 172-178. (The few names or name places misspelled in the original book were corrected / completed. If you see any other ones, please let me know). From the same source, here is the list of marriages celebrated in Red River during the autumn and winter of 1821 and the spring of 1822. The term MEURON refers to the mercenaries-soldiers of the DE MEURON Regiment.